I want to be a lawyer when i grow up - Types of attorneys. "Want To" is a song by country music duo Sugarland. Their first release not to feature former member Kristen Hall, the song was also the first Number One hit of Sugarland's career in the U.S., spending two weeks at the top of the Billboard Hot Country Songs charts in late 2006. Grow Up is the debut album by pop punk band The Queers. Originally issued as an LP by Shakin' Street in 1990, the album was reissued twice afterwards: once in 1994 by Lookout! Records and again in 2007 by Asian Man Records with 5 bonus tracks from the original sessions. Grow Up is a book by British comedian and actor, Keith Allen. Just six days before the vote on Prop 8, the sweet and geeky Paul decides he wants to get married to the man of his dreams. At the same time, he s assigned to work for a conservative client who s campaigning against gay marriage. In the week that follows, Paul embarks on a strange and exciting personal journey to find the man of his dreams, test his moral limits and reconcile with his estranged parents. Virtuoso wordplay, irresistible rhythm, and laugh-out-loud humor abound in the first picture book by the one and only "Weird Al" Yankovic. This unbridled celebration of creativity and possibility invites readers of all ages to consider afresh what they want to be when they grow up. Q: Did you know what you wanted to be when you were Billy’s age? 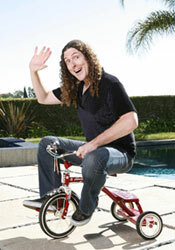 Yankovic: When I was eight? I think chronologically that was sometime after I wanted to design miniature golf courses but before I wanted to be a writer for MAD magazine. I’ll guess that was about the time when I wanted to be a fireworks-maker. Thankfully I didn’t blow any fingers off. Q: What is the weirdest job you’ve ever had? Yankovic: I was an accordion repo man. During my summer breaks from college, I had a job giving accordion lessons to kids at a local music school. The kids usually didn’t own their own accordions, so we had to lend the instruments out . . . for as long as they were still taking lessons. If they ever stopped taking lessons and didn’t return the instrument, it was a job for . . . Accordion Repo Man! Actually, it wasn’t all that difficult—usually they were more than happy to hand the accordions back. Q: Kids talk about being “grown up” a lot. Heck, we all do. What does it mean to be “grown up”? Yankovic: I think it somehow involves the ability to grow hair in disgusting places. Being “grown up” obviously means different things to different people. To most folks, I assume the definition has something to do with the added responsibilities of adulthood and the ability to make more important decisions about one’s own life. Growing up is an important transition, and hopefully a very positive one—although, strangely, whenever somebody told me to “Grow up!” as a kid, it was rarely meant as loving, constructive advice. Of course, if you define “growing up” as having to jettison every last shred of one’s childlike wonder of the world . . . well, then I hope I never grow up. Q: At one point Billy ponders becoming an “artist who sculpts out of chocolate mousse.” That sounds scrumptious . . . and hard! If you could sculpt something out of mousse, what would you create? Q: Do you have any advice for kids who are already thinking about what to be when they “grow up”? Yankovic: Hey, it’s a terrific thing to think about. By all means, explore your options. Find your passions in life. And always remember: It’s never too late to change your mind.